European banks were the worst-performing asset class in the first quarter. That's a good reason to take a look at them. Credit Suisse Group's new CEO, Tidjane Thiam. Image source: Credit Suisse Group. U.S. stocks are kicking off the second quarter little changed in early afternoon trading on Friday. The S&P 500 (SNPINDEX:^GSPC) and the Dow Jones Industrial Average (DJINDICES:^DJI) (DJINDICES: $INDU) are up 0.11% and 0.21%, respectively, at 12:50 p.m. ET. Little changed: The same could be said of the indices in the first quarter. For all the sturm and drang at the start of the year, which culminated on Feb. 11, come quarter-end, U.S. stocks had essentially gone nowhere, with the S&P 500 up less than 1% while the Dow gained 1.5%. If you are believer in mean reversion, as I am, those asset classes could be fertile hunting grounds for investment opportunities. While the first three are extremely broad, the very bottom asset class -- European banks -- is narrow enough to be of particular interest for stock-pickers (and combining the next-to-last and the last asset classes suggests that Italian banks could be worth the first look). Over the past several years, European financials have been one of the top themes of David Herro, manager of the value-oriented Oakmark International fund. According to research company Morningstar, Herro has achieved an annualized 15-year return of 7.95% against just 4.99% for its benchmark, the MSCI ACWI ex-USA Index. That places the Oakmark International fund in fifth place in its category. In fact, as of the end of 2015, two of the Oakmark fund's top 10 holdings were European financials: Credit Suisse Group AG (4.8%) and BNP Paribas SA (3.7%), both of which are top 20 components of the STOXX 600 index. Our favorite European financial is still Credit Suisse because you get the dual benefit of a very, very strong private bank that gives you an annuity-like cashflow stream with what has been a restructured and de-risked investment bank, which should do pretty well as global markets continue to recover and it sells at extremely attractive valuations, basically under ten times normalized earnings. ACWX Total Return Price data by YCharts. All other things equal, it seems like reversion to the mean could be overdue at this stage. Furthermore, Credit Suisse has had a new CEO in Tidjane Thiam since Jun. 2015. If his restructuring is a success, it could certainly produce a rerating in the share price multiple. This Fool has been banging the drum concerning U.S. banks during the first quarter, including during the mini-panic that engulfed financials during the first half of February. 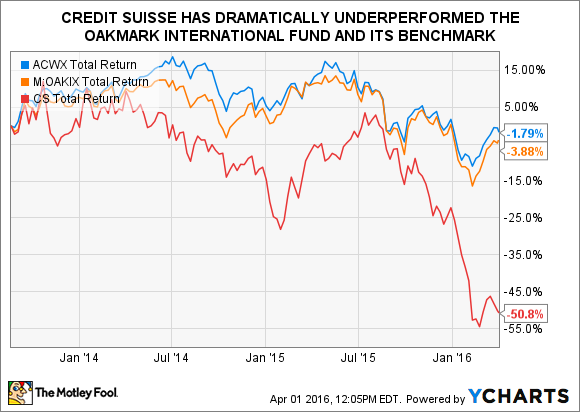 And while I think the top U.S. banks are generally more appropriate for individual investors (particularly those based in the U.S.), I'm convinced select European institutions also present an interesting opportunity, and Credit Suisse looks like one of these.